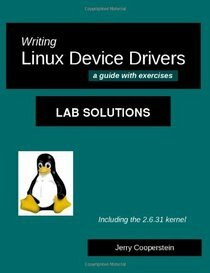 Writing Linux Device Drivers is designed to show experienced programmers how to develop device drivers for Linux systems, and give them a basic understanding and familiarity with the Linux kernel. Upon mastering this material, you will be familiar with the different kinds of device drivers used under Linux, and know the appropriate API's through which devices (both hard and soft) interface with the kernel. You are interested in learning how to write device drivers for the Linux operating system. Maybe you are just doing this for fun, but more likely you have this task as part of your job. The purpose here is to ease your path and perhaps shorten the amount of time it takes to reach a level of basic competence in this endeavor. Our order of presentation is not axiomatic; i.e., we will have some forward referencing and digressions. The purpose is to get you into coding as quickly as possible. Thus we'll tell you early on how to dynamically allocate memory in the simplest way, so you can actually write code, and then later cover the subject more thoroughly. Furthermore, the order of subjects is flexible, so feel free to vary it according to your interests. Each section has exercises, most of which involve writing code, designed to help you gain familiarity with programming for the Linux kernel. Solutions are provided. We are not aiming for an expert audience, but instead for a competent and motivated one.